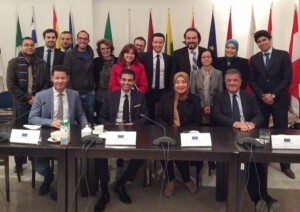 On the sidelines of the visit of the European Parliament Delegation for Relations with the Maghreb Countries on 7-8 April to Tunisia, a panel meeting was organised on the initiative of the Young Leaders Forum. The event brought together parliamentarians from the EU Delegation and young Tunisian politicians and civil society activists in Tunisia. Discussions focused on the involvement of Tunisian youth in the media, civil society organisations and the political process. The meeting enabled a genuine exchange on the aspirations and challenges of Tunisian youth. This debate is the second activity organised by the Young Leaders Forum network in Tunisia. It follows a round table organised during a recent visit by a member of the European Parliament, Fabio Massimo Castaldo. The initiative allows people to establish direct links with young leaders engaged in Tunisia. The Young Leaders Forum is a project launched in 2008 by the European Parliament with the aim of creating a pool of future leaders. An edition for the Maghreb was launched in 2013. Following the second edition of the EU-Maghreb Forum, members of the Tunisian delegation took the initiative to organize themselves to establish a network of young leaders in Tunisia. The purpose of this initiative is to promote the emergence of a network of pioneering young people involved in decision-making.